Home » comedy , commercials , humor , lottery , north carolina , nwa , professional wrestling , ric flair , wooooooo » WHOOOOOO!!! EDIT 3:18 a.m. EST 09/23/2009: I am just now discovering that this game is not called "Ric Flair Scratch-Off" as I had originally thought. Instead it is officially known as... Wooooooo! That's it. I'm definitely going to buy at least one of these tickets. 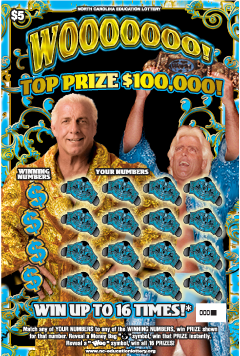 Not to scratch off, just to keep and hold onto because, well... a Ric Flair-themed state lottery scratch-off game called "Wooooooo!" is just too clever to pass up on owning one. I think they've successfully locked in on their target demographic. "Win up to 16 times" because that is probably how many times Flair was world champion?